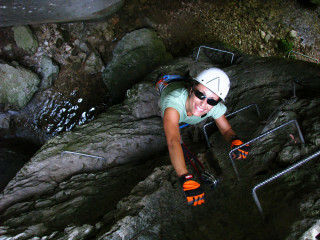 Enter the remote rock canyons of Rio Sallagoni for a via ferrata with loads of fun and without the buzz of tourists. 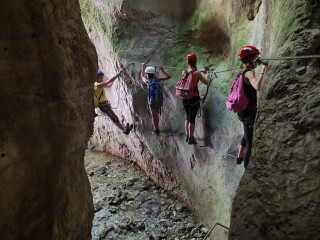 This is a family friendly via ferrata, but it's just as much fun fun for adults without kids. This tour runs every Thursday and Sunday at 9:00 a.m. from April to October. Each guide takes a minimum of 4 and maximum of 8 people. Bigger groups will be split up among guides. Minimum height to participate is 1.4 m (55 in). Solid fitness is required. Please wear ferrata boots or hiking shoes. Looking for both peace and quiet and a fun adventure away from the crowds of Lake Garda? 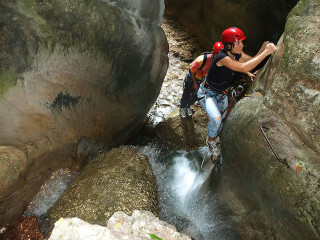 The canyoning of Rio Sallagoni is your answer. 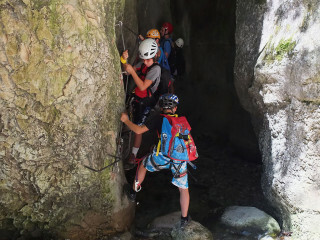 With an exciting path through untouched nature, the area’s spectacular gorge is the ideal setting for via ferrata beginners or a some serious outdoor fun for families with adventure loving kids. The canyon is located on the edge of the hill hosting medieval ruins of the Drena Castle. Meeting near the castle at 9 am, your guide greets you and equips you with the necessary equipment. 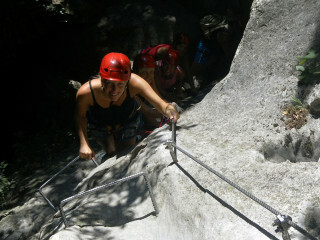 After a short walk and an introduction, the canyoning fun begins! We enter a new realm of ferns and pebbles as we weave through slim rock passages. Traversing over cascading streams, it’s almost as if we’re walking on water. A few suspended bridges and overhead wires test your hiking abilities on a new level. We explore for 2.5-3 hours before heading back to the meeting point. A short but varied route in a wild and fairytale atmosphere will lead you to the magnificent Castle of Drena, ideal for cooling off in the summer. 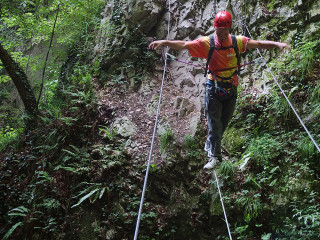 With only rocks, water, and plenty of greenery around, the rugged environment of the Via Ferrata Rio Sallagoni is the outdoor lover's paradise.